Tintri smart storage is an always-optimized storage platform purpose-built to address the challenges of deploying general-purpose storage in virtual environments. Built using the industry's first and leading application-aware storage architecture and FlashFirst design, Tintri VMstore eliminates the need to setup LUNs and volumes and is easily deployed as a single datastore in virtual environments, delivering 99% IO from flash to provide unparalleled performance in a compact form factor. The Tintri plugin for VMware vSphere Web Client is the next milestone in enhancing our integration with VMware, a journey that started with Tintri VAAI plugin for creating space and performance efficient clones from vCenter interface. The Tintri vSphere Web Client Plugin extends other Tintri application-aware benefits to vCenter. Natively integrated with the VMware infrastructure, Tintri vSphere Web Client Plugin allows administrators to use Tintri VM-level capabilities, such as snapshots, clones and replication, from vCenter interface to further simplify day-to-day management of large virtual environments. VMstore Dashboard: Tintri vSphere Web Client Plugin provides rich insights into VMstore level performance and capacity usage and trending metrics eliminating the challenges administrators face in performance and capacity monitoring and trending. The unique performance and capacity gauges give administrators immediate visibility to both the available performance headroom and storage capacity on any Tintri VMstore appliance. For the first time, administrators can get storage performance utilization with a single, easy-to-use metric – right from the vSphere Web Client. The Tintri dashboard information also quickly identifies VMs with the most changes in performance or capacity utilization in the past seven days without the need to understand how VMs map to the storage components. All you need to know is the name of the VM and Tintri VMstore presents the details to you. 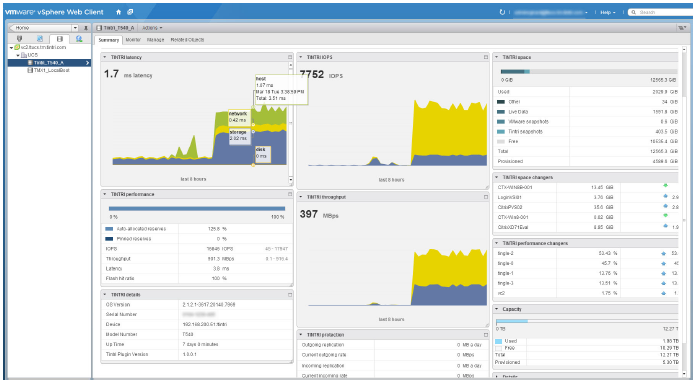 The Tintri VMstore Dashboard as seen in the vSphere Web Client. Modules shown include 8-hour historical graphs of latency, IOPS and throughput, and instantaneous information on capacity, space utilization and notable space and performance changing VM's. Review and Acknowledge VMstore Alerts: Tintri vSphere Web Client Plugin provides integrated monitoring and management of Tintri VMstore systems in the vSphere Web Client UI. Administrators can review and acknowledge alerts from multiple VMstore systems centrally from the vSphere Web Client UI. Centralized monitoring also allows the administrators to correlate the alerts from VMstore with those from the rest of the virtual infrastructure to get an end-to-end picture. VMstore Inventory Summary: Tintri vSphere Web Client Plugin provides a summary of all VMstore systems deployed in the virtual infrastructure. Administrators can view summary VMstore characteristics such as VMstore model number, serial number, Tintri OS software version, uptime and then drill down to get additional details, such as performance and capacity dashboards, at a VMstore level. Incrementally Scale by Adding VMstores: With Tintri vSphere Web Client Plugin, administrators can add a new VMstore and a datastore to the vCenter infrastructure with just a few clicks. Each VMstore appliance appears as a single datastore in vCenter, making it easy to scale and manage multiple VMstore systems as a VMware Storage DRS cluster. Update VMstore Configuration: Tintri vSphere web client allows administrators to centrally update the configuration of VMstores, including modifying the default snapshot schedules for VMstores to adapt to the changing needs for data protection. Instantly Diagnose VM Performance issues: Performance bottleneck troubleshooting is a tedious management task as it is often difficult to pinpoint the source of the problem. With Tintri vSphere Web Client Plugin, administrators have instant visibility, from the guest OS layer to the storage layer. They can see VM-level latency breakdowns in real time at any infrastructure layer—host, network and storage—to identify the source of performance issues and take immediate action (shown at right). 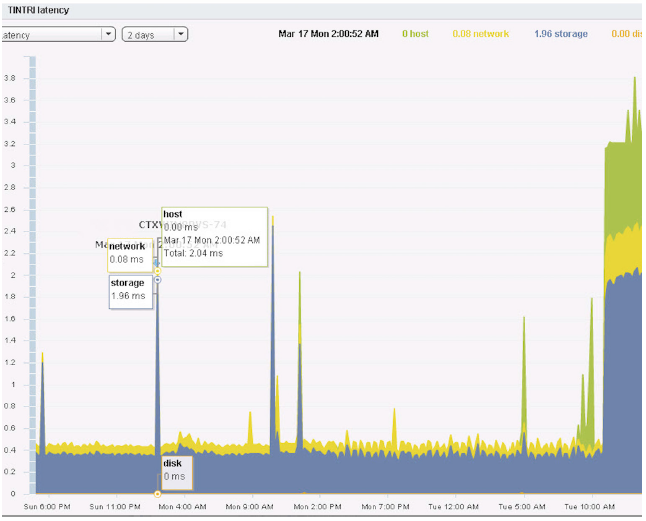 The Tintri vSphere Web Client Plugin also provides historical graphical view of the performance metrics for easier troubleshooting. VM-Level Space Efficient Snapshots and Clones: Just like the native Tintri VMstore user interface, Tintri vSphere Web Client Plugin enables VM-level data protection with Tintri space and performance efficient snapshots. Default snapshot schedules protect every VM automatically; custom schedules allow users to meet specific data protection needs. The vSphere Web Client Plugin allows creation of space efficient VM-level clones that are immediately visible in the vCenter server. Data protection schedules can also be customized on a VM-level basis from the vSphere Web Client UI. Additionally, the Tintri VAAI plugin can be leveraged to create space and performance efficient clones. VM-Level WAN Efficient Replication: Tintri vSphere Web Client plugin enables administrators to configure VM-level replication to extend data protection to remote Tintri VMstore systems. Tintri VM-level replication sends only changed blocks between snapshots after global deduplication and compression to reduce the WAN usage by up to 95%. Retention policies can be customized at a VM-level for local and remote snapshots. Clone VMs are replicated and stored highly efficiently as the common snapshot on remote VMstore is used to re-create clone VMs, which results in no data being sent over the WAN and no additional storage space consumed on the remote VMstore for storing the replicated copies. Download the Tintri vSphere Web Client Plugin Datasheet (PDF).